Today, since it's the day before Thanksgiving and I'm sure lots of you have families and cooking and visitors and traveling to attend to, I'm going to do my best to be brief. It wouldn't be Would You Read It Wednesday without Something Chocolate, would it? So how about this? Now that we're happily snacking, let's move right on to today's pitch (without any entertaining anecdotes or silly banter because just look how brief I'm being!) which comes to us from Lyla. Lyla is an artist and creative writer. The Good Morning Book was written just as much for the parents as for the child, it's a gentle reminder to find the beauty in every day life and to be grateful for all of life's marvelous wonders. She also owns an Etsy store called "Personalize Love" which features hand stamped jewelry and book marks. The Pitch: Start your day exploring the wonders of this world with The Good Morning Book. This book will inspire young ones and adults to take time out of every morning to appreciate all of the things that make life special. An easy read with rhythmic flow, children of all ages will enjoy. Please send YOUR pitches for the coming weeks! For rules and where to submit, click on this link Would You Read It or on the Would You Read It tab in the bar above. There are openings in February so you've got a little time to polish up your pitches and send yours for your chance to be read by editor Erin Molta! Lyla is looking forward to your thoughts on her pitch! I am looking forward to celebrating Thanksgiving with my family - I have so very much to be thankful for, including all of you! And I'm looking forward to the Linda Ashman Rhyme Clinic which will take place here on Monday! It promises to be AMAZING! I feel bad saying "maybe" for the first time...but just like last week when I said the pitch was more like an ad than something to entice readers, that goes doubly so for this pitch. Lyla's book sounds like it has a lot of cute potential but we know nothing of the actual content. As Tina said, it could use an opening line or two from the book. I would like a bit more if a synopsis too. Best of luck to Lyla! Those turkeys! Neighbors down the street did them for their 2 little boys and you should have seen their smiles. Of course said turkeys didn't live long! Happy holiday to you and yours, Susanna! I'm thankful for all you do for us authors. For Lyla, the title draws me in, but the pitch as written does not give me a sense of what to expect. Sense is an apt word: a PB needs to be full of sensory images; maybe add examples of some of the "wonders of the world" the book intends to use? So it's a Maybe for me, too. To Lyla: Like others, I'm intrigued by your title and feel it has potential to be a very special sharing book between adult and child, but there's nothing specific enough in your pitch to really grab me. I'm not going to bother reading it unless I see a specific example of *how* this book is "inspiring." And to Susanna: Gobble gobble (and Happy Thanksgiving) to you too! A more specific pitch, citing one or two examples, would grab more readers. Lyla--mornings are such a chaotic time in modern households, I like the idea of taking time to be appreciative. I would read it, but I don't like the word "special" and I bet you could come up with a better word. Happy Thanksgiving! I find the title interesting. To hook me into reading it I want to know why it is important to appreciate starting my day with exploring...maybe an opening sentence would include Main Character, a text or sensory or setting details that are in the book. For example, " Monday mornings are good, good , good at Sam's house. Sam loves the smell of pizza and coffee. Each morning Sam discovers ..." I would know the character's name, where the story takes place, and what makes one of his mornings good. I would be inclined to read further to answer the discovery question. First of all, YES. Every book ends with a good night of some sorts, which is frankly tiring after awhile. What if we want to read at some OTHER time in the day?? :) I did find myself wanting to know a little more about the story though. Instead of telling us it will inspire kids, how about showing an idea in the book that will inspire them? I like the other ideas here about a character name, too. That might help. But love it. Good luck! Lyla, I'm a maybe leaning toward yes. This sounds like a concept book that would interest me. I agree that your pitch needs to give us more of a peek into your book. Give us something in your "dust jacket" blurb that gives us a sense of why it is inspiring. Also, you've already told us that both kids and adults will enjoy it and then you say "kids of all ages" in your next line. That's repetitive. My favorite of the two is "kids of all ages". I think the idea of a morning book is a great one, but I agree with others -- we need more than what is here. It would help greatly if we had some idea of the characters and one or two concrete examples of what makes mornings great. Happy Thanksgiving, Susanna, and the same to everyone out there. My favorite holiday! Sounds lovely! I would take out everything from This book on amd swap it for a character and their motivation. What the others said. Happy Thanksgiving! 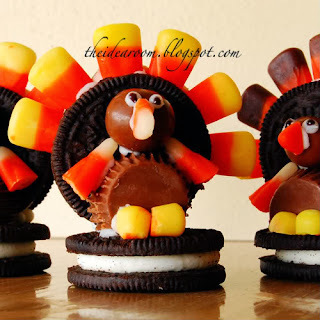 Yummy Ordy (Oreo + candy) turkeys! I would read the book, but the pitch is too short - I want to know more! :) I love the message, Good luck Ms. Lyla! Hi Tina, thank you for your comments. We must both be thinking of the same idea because this world needs a few good "Good Morning Books" ! Happy Thanksgiving!! Thank you Andrea, yes, very helpful! Thank you for saying "maybe" and don't feel bad, Teresa. I love constructive criticism!! and you're so right this is kind of more like an ad than a pitch :) lots to work with and I'm grateful for all the insight! Happy Holidays! A blessed and happy Thanksgiving to you, too, Susanna. Enjoy your family time! Just wanted to say that I am so thankful for this entire community...of supportive, loving and encouraging people! I agree with the others that more specific info is needed and using a line or two from the book might just be the answer. It will both tell what the book is about and also reveal the easy to read, rhythmic flow. The title is inviting! Happy Thanksgiving everyone! I too am grateful for this great community we are part of! So...much...candy! Add that to the three desserts I'm already planning to eat. Lyla, THE GOOD MORNING BOOK sounds lovely, and I can't help but think of GOODNIGHT MOON--esp. since it's for ages 0-4. Along those lines--if it is more like GM (more repetition and images than plot and character), I thought the Amazon "pitch" for GM might be helpful. It gives a character (bunny), examples of images, and a great sense of the book's voice. In a great green room, tucked away in bed, is a little bunny. "Goodnight moon, goodnight room." And to all the familiar things in the softly-lit room--to the picture of the three little bears sitting in chairs, to the clocks and his socks, to the mittens and the kittens--he says goodnight. Hopes this helps. Happy Hanukkah! Happy Thanksgiving! Brilliant Stacy!!! What a great idea :) Thanks so so so much!! Happy Holiday to you! Hello Everyone! Thank you so much for taking the time to comment on this book, I'm so grateful ALL of the remarks! Hope everyone has an awesome Holiday Season! The book sounds lovely, but a personalized pitch to a child might help. Sorry I'm late! I like the idea of a good morning book, but I cannot be sure of what will be offered in the pitch - more details please! Maybe choose your favorite three lines form the ms and try to incorporate them in the pitch? Thanks for chiming in for Lyla, Nancy! :) Hope you had a lovely Thanksgiving! Perhaps I am related to Captain Underpants :) Glad you like the turkeys, thanks for your thoughts for Ms. Nutt, and hope you had a GREAT Thanksgiving! Thanks for your helpful comments for Lyla, Iza! Hope your Thanksgiving was lovely! I too am grateful to be part of this wonderful community! What a great example, Stacy! Thanks for sharing! Happy (belated) Thanksgiving! Happy (late) Thanksgiving everyone! I can barely get teeth brushed and shoes tied before school, and I don't even know when I showered last, so the thought of also exploring the world during the morning too stressed me out! :) But that's with a 3yo & 5yo at home, and if I try I can remember calmer mornings back in your target age range of 0-4 (3?) before I lost all control. Consider a different word choice than "wonders of the world" to be more specific with what's on the pages. (unless it is about the pyramids and the lost city of Atlantis, then keep it!) I can tell from the pitch that it is likely to be soft and cuddly and dreamy. Thank you!!! Great comments and also a fair warning about my future... I have a 1 year old. Your right about the wonders of the world, thank you again for such thoughtful comments and taking the time to help out my pitch! Thank you Julie, great points to consider! Perfect Picture Book Friday - Bugs! Bugs! Bugs!